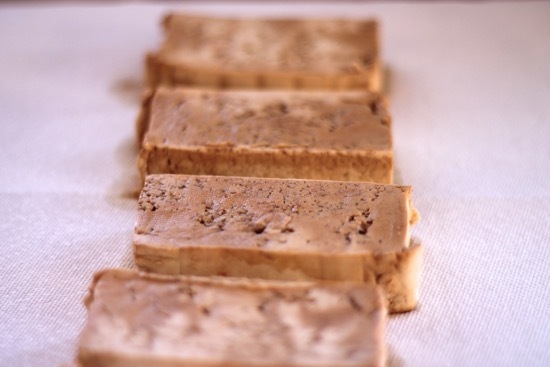 Warning, this recipe features tofu. I think some people tend to get panicky when introducing tofu. It’s not everyone’s “thang” and that’s okay, but it’s fun to try different foods once in a while, right? I became very close to tofu when I was a vegetarian. I completely cut meat out of my diet for a couple of years, and it quickly became a staple. Tofu doesn’t really have any flavor. It takes on the taste of whatever seasonings you use. Never eat it right out of the container; you will live to regret it. Usually, I have it crumbled, so when I saw this recipe in the next episode “Tofuworld” I was excited to give it a try. 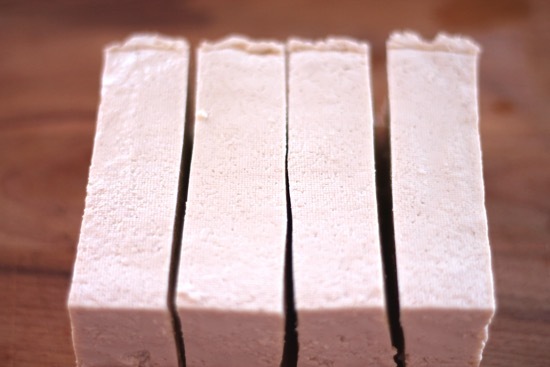 Just eat a slab of tofu? Okay I’ll give it a try. While this recipe was not my favorite, I’m happy I gave it a go. I think a little longer marination period would’ve made me enjoy it a lot more. Instead, it fell flat in the flavor department and tasted a little too much like plain tofu in the middle. But, this gives me a great foundation to play with. The edges were perfectly crisp and the texture was just right. You can change-up the marinade and slice size, or just crumble it up like ground beef in the skillet. My next marinade will be soy sauce, brown sugar and some chipotle peppers in adobo sauce, pulverized in the Vitamix. Yum! 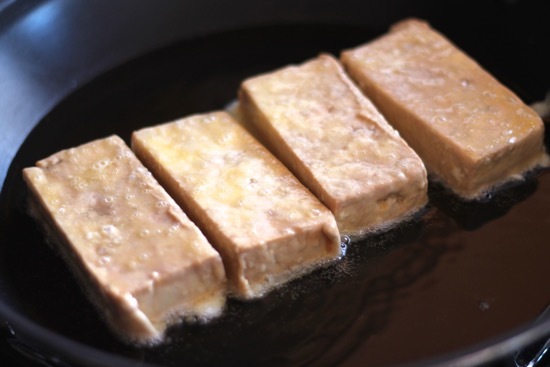 This is a great method for preparing tofu. Experiment, find the flavors you love and give it a try! Get your block of firm tofu. Slice it into 4 equal pieces. Place the pieces on layered up paper towels. Lay a sheet pan right on top with a weight. A can of tomatoes or a bowl full of water will do. We’re going to weigh it down for about an hour to release some of the moisture. 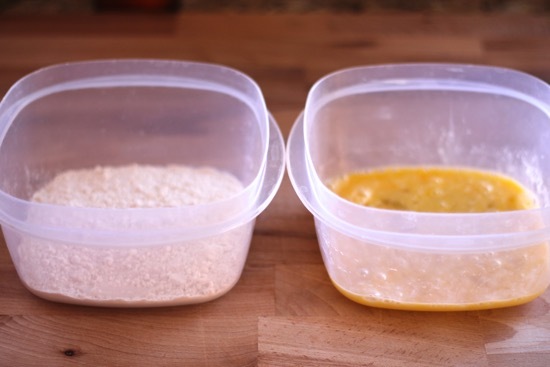 Place flour and beaten egg into separate dishes to prepare for frying assembly line. 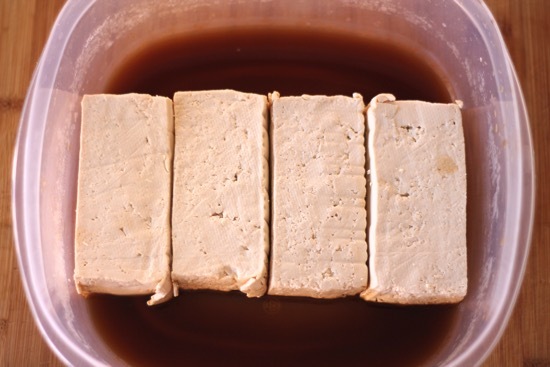 After the tofu has been squeezed, marinate the tofu in sherry vinegar, Worcestershire sauce and hot sauce for 15 minutes. Flip and marinate for another 15 minutes on the other side. Gently pat off the excess marinade. Dip the tofu in flour and shake off the excess. Then dip into beaten eggs. Gently slide the pieces right into the hot pan. Cook for about 2 minutes on each side. 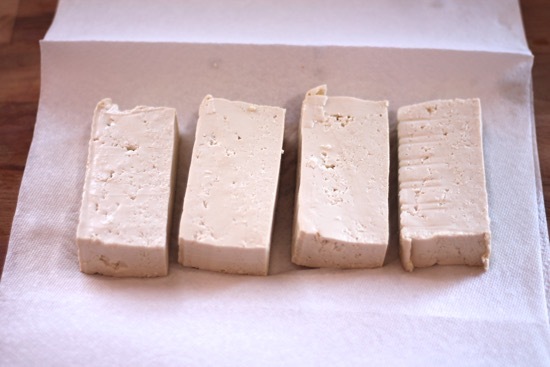 Slice your block of tofu into 4 equal pieces. Place the pieces on some layered up paper towels. 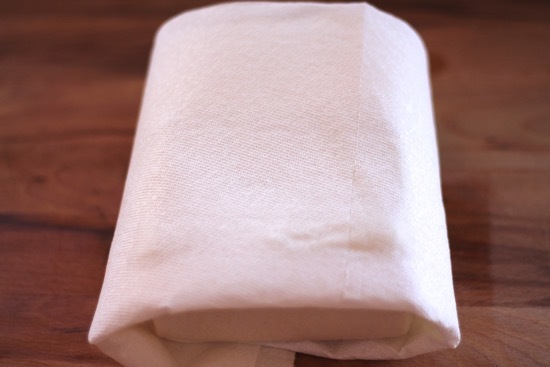 Fold the paper towels over the tofu pieces. 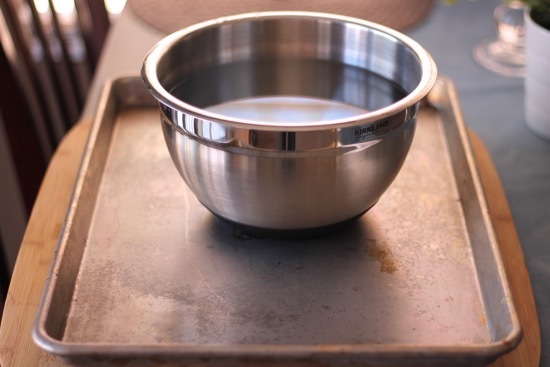 Place a baking sheet on top and weigh it down with a large can of tomatoes or a large bowl full of water for 1-2 hours. Combine sherry vinegar, Worcestershire and hot sauce in a shallow dish. Place the tofu pieces in the marinade. 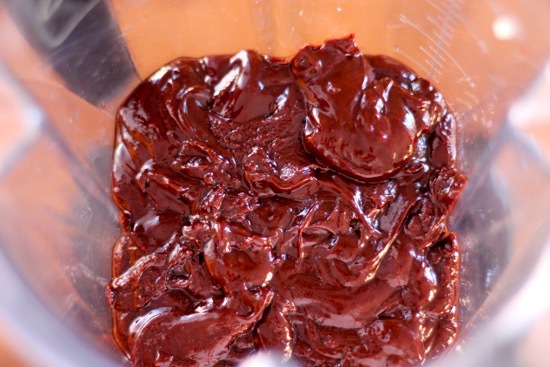 Let marinate for 15 minutes on each side. Heat the oil in a skillet on medium heat. Place flour into one shallow dish and the eggs into another. Gently beat the eggs. 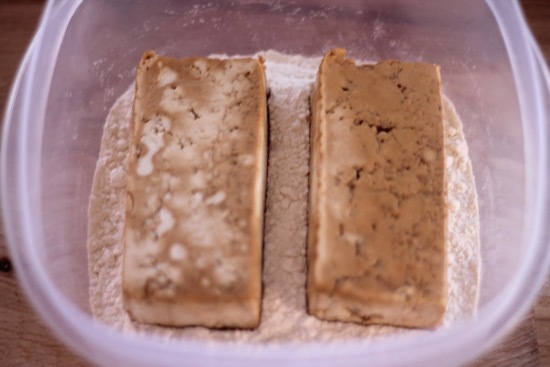 Dredge the marinated tofu pieces into the flour, making sure to shake off all the excess. Next dip into the eggs. 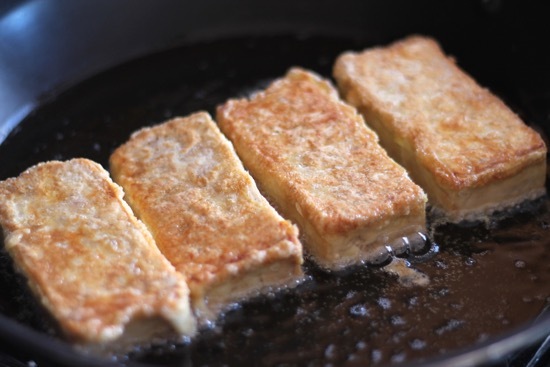 Gently place the tofu into the oil and cook for 2-3 minutes on each side until nice and golden brown. Chocolate Pie, does it get any better than this? If you ask my husband, he’d tell you no. 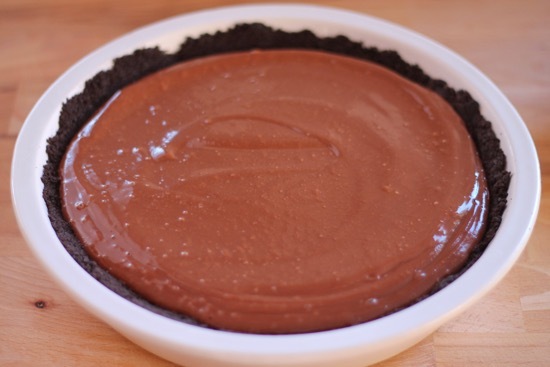 This chocolate pie recipe is a bit different, it has a twist. It’s moo-less. What’s moo-less you ask? No dairy. In fact this pie is completely vegan (if you use Earth Balance instead of butter in the crust), because…wait for it…it’s made with tofu. Trust me when I say, your family and friends will have no idea. Just feed it to them. They’ll never know the pie you just served them, is made with tofu, right Dad? I jazzed up the crust a little bit, mainly because I couldn’t find chocolate wafers. I usually have no problem finding them, but 3 stores later, there were none to be found. Maybe there’s some sort of chocolate wafer shortage, or perhaps it’s a conspiracy…I love a good conspiracy theory! When in doubt, (or in the great chocolate wafer shortage of 2015) just use Oreos. They’ll never let you down. 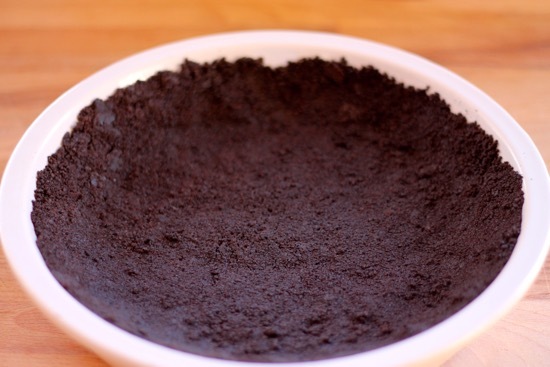 Pulse the Oreos until they turn into fine crumbs like so. Add in 1/4 cup of melted butter and continue pulsing until it’s all mixed together. …and press into the bottom and sides. 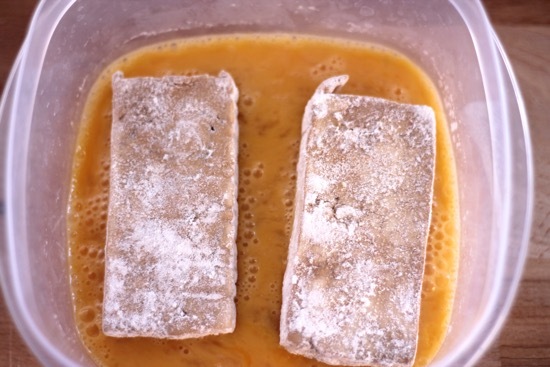 Refrigerate for 1 hour. You could just buy a ready-made Oreo crust at the store and use that, but then you’d be missing out on that 3rd row of leftover cookies, food for thought. Next, chop up your soft tofu into little pieces. Dump those into your blender. Melt chocolate chips (make sure they’re vegan if you’re going for a vegan pie), Kahlua and vanilla extract in the microwave, 30 seconds at a time, stirring each time until chocolate has completely melted. 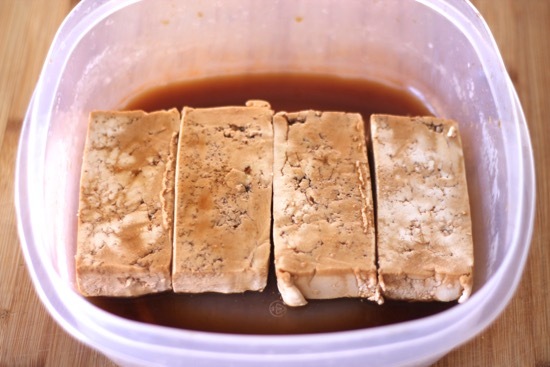 Pour the mixture right over the tofu with a tablespoon of honey. 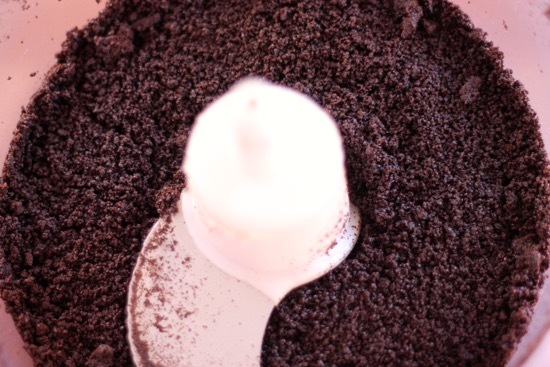 Blend until completely smooth. Pour the filling into the refrigerated pie plate and put back in the fridge for 2 hours. That’s it! Slice and serve. 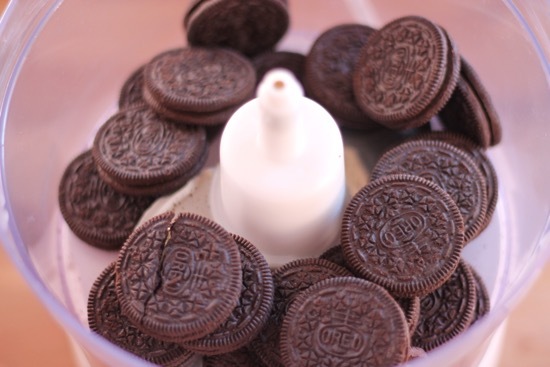 Start off by sticking the Oreos into the food processor. 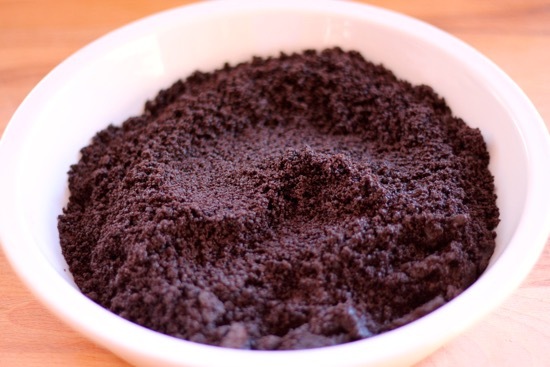 Pulse the Oreos until they turn into fine crumbs. Melt the butter in the microwave for about 30 seconds. Add the melted butter to the Oreos and continue pulsing until it’s all mixed together. 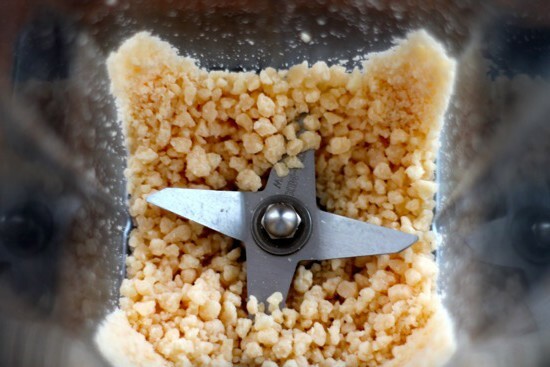 Pour the crumbs right into your pie dish, and press into the bottom and sides of the dish. 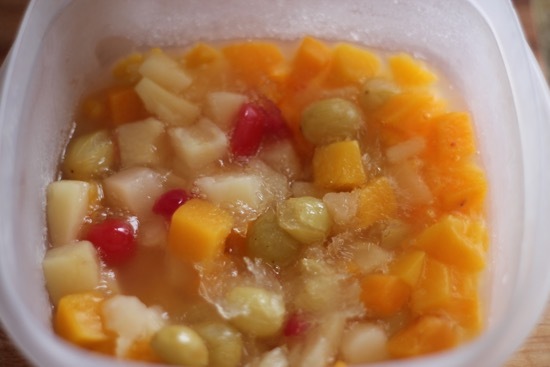 Refrigerate for 1 hour. 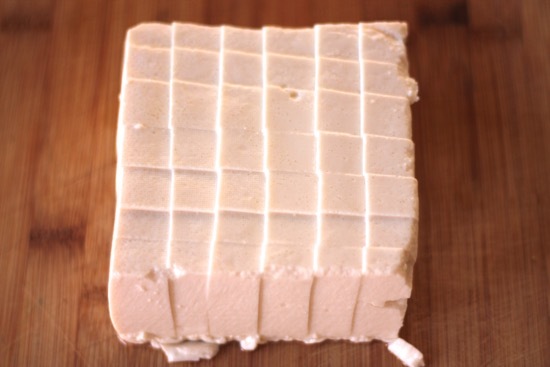 Next, chop up your soft tofu into small cubes, about ½ an inch. Dump those into your blender. Melt chocolate chips, Kahlua and vanilla extract in the microwave 30 seconds at a time, stirring each time until the chocolate has completely melted. Pour the mixture right over the tofu and add in the honey. Blend until completely smooth. Caesar salads are one of my all time favorites. I just had one for dinner this week on a girls night out with the Moms in my life ❤ The salad itself is pretty boring, but the incredible flavors from the dressing are what gives it life. 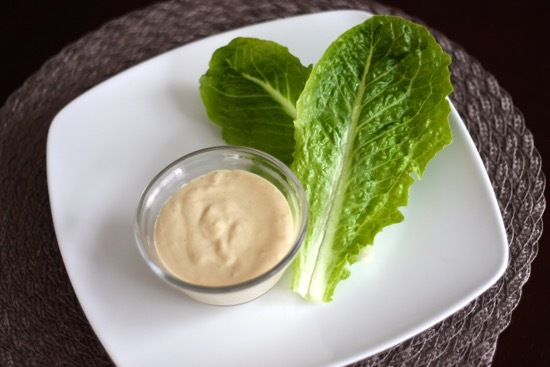 I’m a total snob when it comes to Caesar dressing, and this one’s a winner! It’s salty, tangy and sharp, just how I like it! The classic Caesar dressing is made with raw eggs and anchovies. I do love the classic, but for this recipe, we’re changing it up. We’re going to get our anchovy flavor from Worcestershire (most Worcestershire sauces contain anchovies) and replace the raw eggs with tofu. 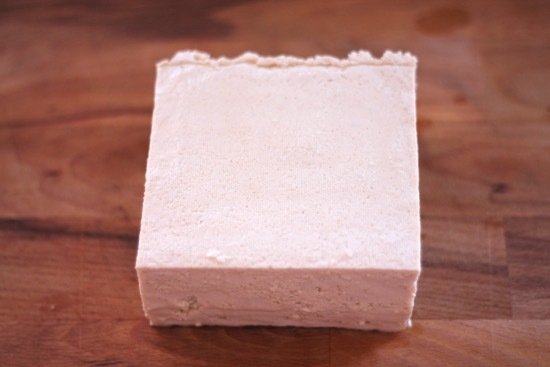 Because tofu has emulsifiers in it, it’s the perfect replacement for the eggs. If you’re squeamish about raw eggs, this is a great alternative for you. All you need is your trusty blender. 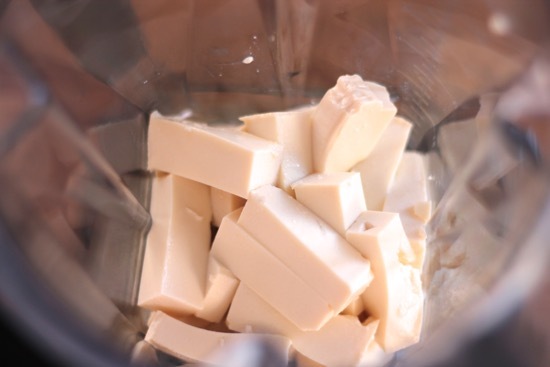 Start off by adding 2 ounces of cubed Parmesan cheese to the blender. Blend on low until the cheese gets chopped up into tiny pieces, like so. Next, add in the garlic, Dijon mustard, white wine vinegar, Worcestershire sauce, salt, pepper tofu and olive oil. Blend until smooth. 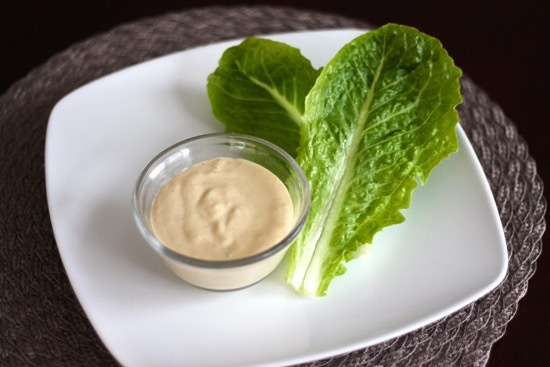 Pour into a small bowl and dip your Giant Caesar (from your garden ) or Romaine leaves right in. If you’ve never eaten a Caesar salad with your fingers this way, I highly recommend giving it a try. 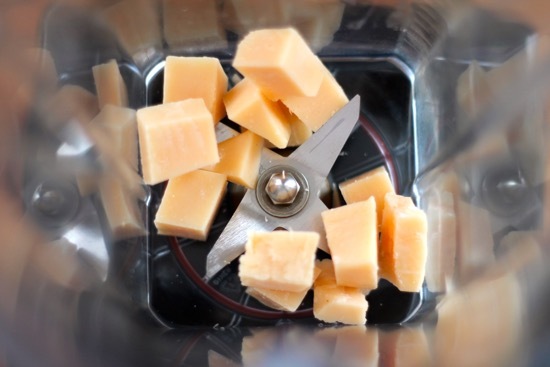 Add cubed Parmesan cheese to blender. Blend on low until it starts to get chopped into tiny pieces. Next, add in the garlic cloves, Dijon mustard, white wine vinegar, Worcestershire sauce, salt, pepper tofu and olive oil. Blend until smooth. 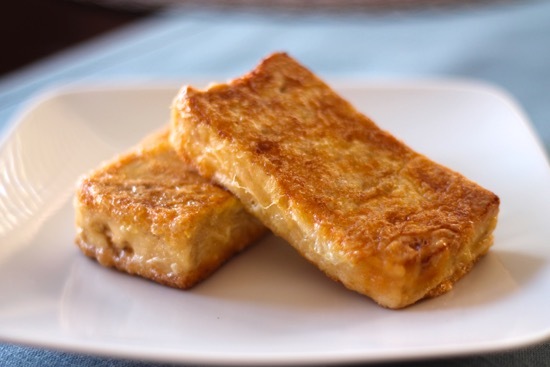 The last tofu recipe from Good Eats “Tofuworld” episode is this Tall and Tangy Tofu Thangy. How to describe this recipe…well, the title says it all. It’s a tangy thangy for sure. I think smoothies have come a long way since Mr. Alton Brown first did this recipe some 10 plus years ago. It wasn’t horrible, but sadly, it just wasn’t that tasty. 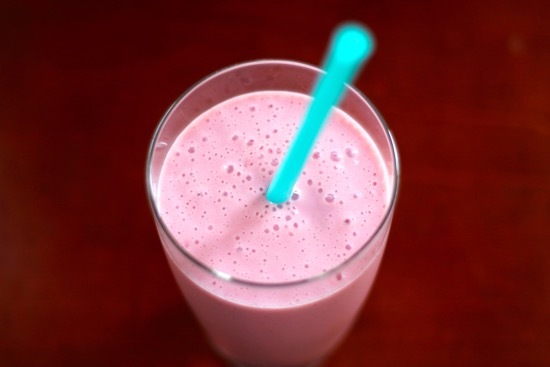 It lacked flavor and sweetness that I come to love from the smoothies I make. I think if you changed up the fruit with some frozen mixed berries and added a banana in, it might be a winner. This combination though, as much as it pains me to say it, was not Good Eats. I guess they can’t all be winners, right? I like the idea of adding tofu as your protein source to a smoothie, so I will give this a try in the future, just not with a can of fruit cocktail. Here’s how Alton makes it. 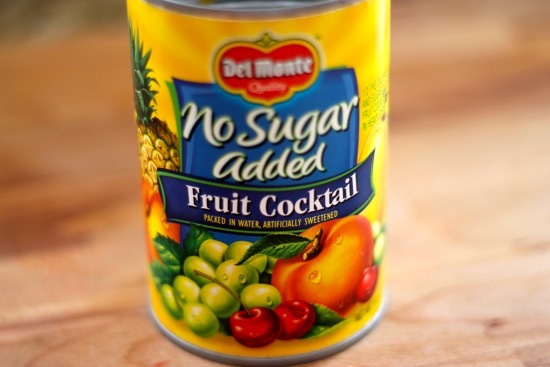 Start off by getting a can of fruit cocktail with either no sugar added or in light syrup. 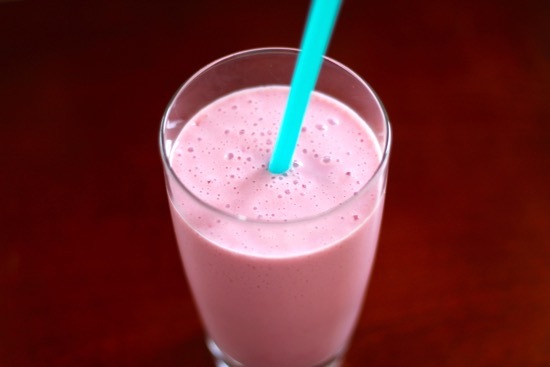 Add half of the frozen fruit, lemonade mix, tofu and cranberry juice to the blender. 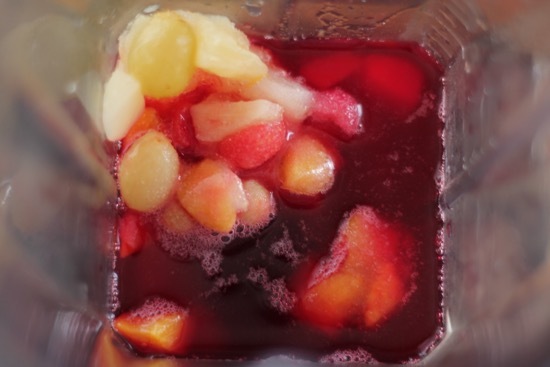 Start off by getting a can of fruit cocktail with either no sugar added or in light syrup and freeze it in a separate container. Recipe courtesy of Alton Brown and Food Network.